Graffiti artist Banksy has pulled off an audacious stunt amid tight secrecy to stage his biggest ever exhibition. 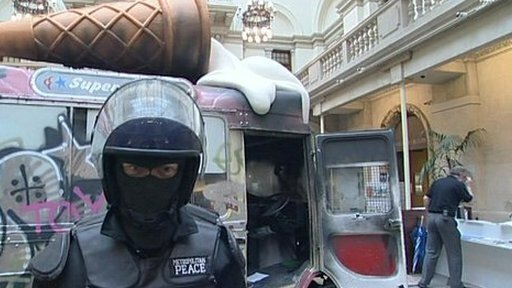 A burned-out ice-cream van is among 100 works Banksy has installed at Bristol's museum, replacing many of the museum's regular artefacts. The reason the museum was closed was kept secret from top council officials. Banksy said: "This is the first show I've ever done where taxpayers' money is being used to hang my pictures up rather than scrape them off." Staged in the council-owned City Museum and Art Gallery, Banksy v Bristol Museum features animatronics, installations and a sensory display. "This show is my vision of the future, to which many people will say: 'You should have gone to Specsavers'", Banksy added. The exhibition and its location have been a closely-guarded secret since October, with just a couple of museum officials in the loop. "I think we may have dragged them down to our level rather than being elevated to theirs," said Banksy of the subterfuge involved in staging the show in his home city. Museum director Kate Brindley said it was a huge relief to finally be able to talk about the exhibition, and admitted they had taken a "risk". Plans for the summer show were kept from Bristol City Council chiefs until Friday - the day before it was due to open. Whatever you think of Banksy, his art and his stunts, what he's done here is pretty extraordinary. Normally this grand building is home to artefacts and paintings remembering Bristol's maritime history, but today the Edwardian halls are filled with Banksy's unique blend of anger and humour. All this - and hardly anybody knew about it. Exactly WHO Banksy is remains shrouded in mystery - we do know he grew up in Bristol, and this free exhibition is said to be his way of thanking and rewarding the city. Many people are proud of him - he's become one of Bristol's most famous (and notorious) sons - others are bound to question whether a guy who spent his youth spray-painting walls deserves to be given this platform. Either way, you've got to hand it to him - he's done it again! Bristol has had a love-hate relationship with Banksy since he started stencilling on the city's walls in the 1990s. There is likely to be criticism of the decision to stage an official expo of his work. "We ran a bit of a risk," said Ms Brindley, "but we knew that it was just the right thing for the city. "Equally there's so many people in Bristol who just love Banksy, and internationally. He's a megastar. "We're a gallery that wants to work with contemporary artists - he's our home-grown hero." The artist himself was involved in setting up the exhibits and came to the museum to oversee its installation, but staff were unaware who he was among the crew setting up the show. Although Bristol has seen work by Banksy adorn the city's walls, this is his first official indoor exhibition in the city since 2000. That show was held at the Severnshed restaurant on the waterfront and featured several paintings which have since gone on to sell for thousands of pounds at auction. 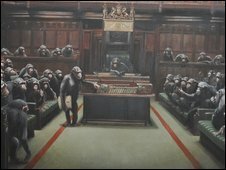 Banksy has exhibited in New York, Los Angeles and Bethlehem. He became famous after a series of "guerrilla" stunts which saw him paint the West Bank barrier and put an inflatable figure of a Guantanamo Bay prisoner at Disney World. It was Bristol where he first made his mark though, with a series of graffiti paintings on iconic local buildings such as the city council headquarters, an M32 bridge and the Thekla floating nightclub. His work has since become highly collectable, and has attracted buyers including Brad Pitt and Robbie Williams.